Silhouette Secrets seems off to a flying start. We took part in two film festivals towards the end of 2015 and have applied for many more this year. The first two festivals were the Marbella International Film Festival, where we were nominated for Best Documentary, and NiFF Houston, where we won the Best Documentary Award. I’m obviously *really* happy to have done so well at my first two Film Festivals. 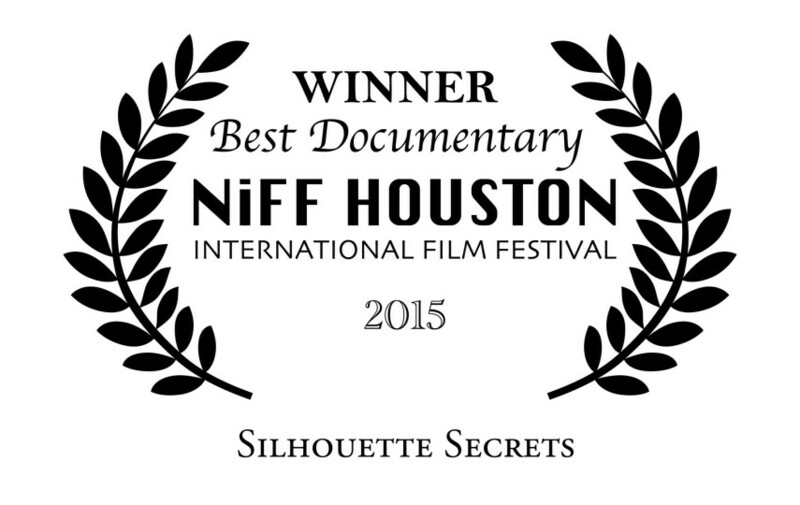 When booking me to cut silhouettes at your next company function you can introduce me as the presenter of the award-winning documentary Silhouette Secrets! 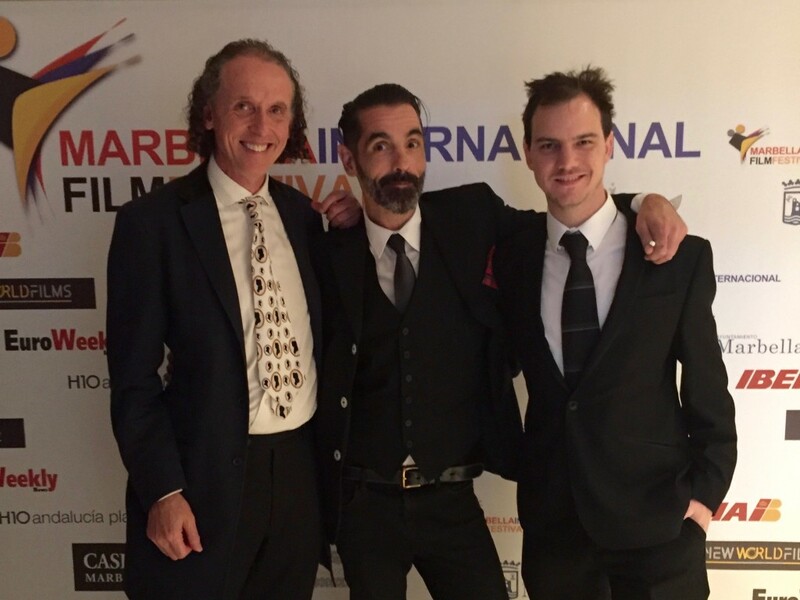 Charles Burns (presenter) Andi Reiss (director) and Ollie Richards (editor) at the Marbella International Film Festival, where Silhouette Secrets was nominated for Best Documentary. 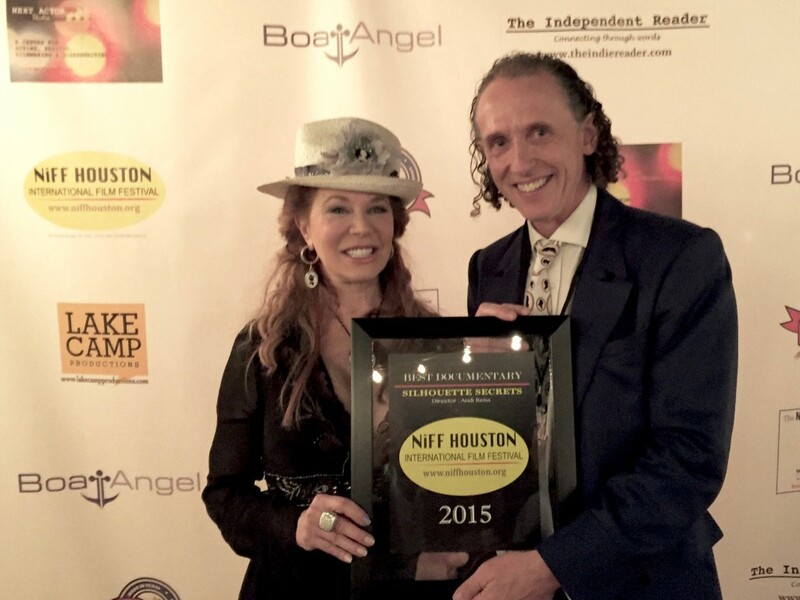 Cindi Rose and Charles Burns pick up the Best Documentary Award at the Next International Film Festival in Houston. Since these festivals we’ve been selected to screen at the Impact Doc Awards (an on-line festival in California.) We’ve also submitted the film to a number of other festivals, all over the world, taking place in early 2016. You can follow our progress as we journey through more festivals on our Silhouette Secrets Facebook page. We’re currently looking for partners to help us get the film on TV, both in the UK and the USA. The plan is to screen at many more festivals and pick up another award or two (Andi thinks a dozen would be good). We can then use this level of approbation to take our award-winning documentary to busy TV executives. With any luck they’ll at least watch it! I’m learning that the world of the independent film maker is nothing if not a hazardous one. We seem to be walking a kind of financial tightrope. Fabbie website. Corporate events looked amazing and reminded me of ours a couple of years ago! Keep up the good work and remember the mirrors you made were brilliant, mine is always in my bag. Thanks Julie. The mirrors never really took off somehow, but they are a nice idea. Charles well done I’m really looking forward to seeing the film in full, let us know if you manage to get a broadcaster to transmit it. Congratulations on you’re recent success Charles! I can’t wait for our clients to book you for their next event! I still have my silhouette on my desk here! This is really exciting! What a wonderful addition to all the other events you get up to! Look forward to seeing the progress of this!! 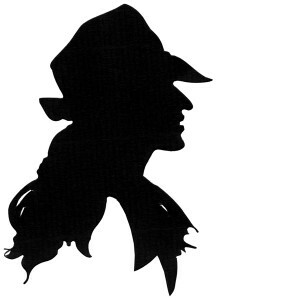 As an animator I have used silhouettes over the years. Black silhouettes on film Lotte Reineger style,and more recently, colour, digital silhouettes which, as vector shapes, are really flexible for animation. Thank you for sharing. I’ve never really got the hang of vector graphics myself. Are there any examples of your work in paper? That’s really great news Charles – I’ve been tracking this since you started to crowd source the project. This is a real “digital detox” and a craft that leaves everyone literally gasping at the skill and artistry of it all. I have booked you for corporate events and my daughter’s wedding in 2015. Guests still talk about their Silhouette to this day! Charles, I am so proud of you and the accomplishments you have made with Silhouette Secrets. I hope that you do make your goal and that we shall soon see you on TV. Good luck in all your ventures. The website is looking great. Glad to see you have put the snippets to good use. Fingers crossed for the screenings to come! A fascinating documentary, hopefully it will be on TV soon.